What a lovely way to round off a week of posts. Charbonnel et Walker remains one of the oldest and finest chocolatiers of the UK. It’s hard to believe that their first shop opened way back in 1875 in London Bond Street. As for the name; it’s the surnames of the ladies behind the brand – Mrs Walker and MMe Charbonnel. I did visit the London store many many years ago. It is one of those very upmarket shops, the type where your wary of knocking anything over but a lovely luxury shop and certainly worth a visit if down that way. Charbonnel is a luxury brand and therefore as you can imagine; the chocolates come at a luxury price. These are not your everyday or weekly supermarket munchies but rather luxury gifts for very special occasions. They sell just about every type of chocolate gift, be it boxes of truffles, hampers, chocolate selection boxes, even a chocolate shoe and a champagne set. 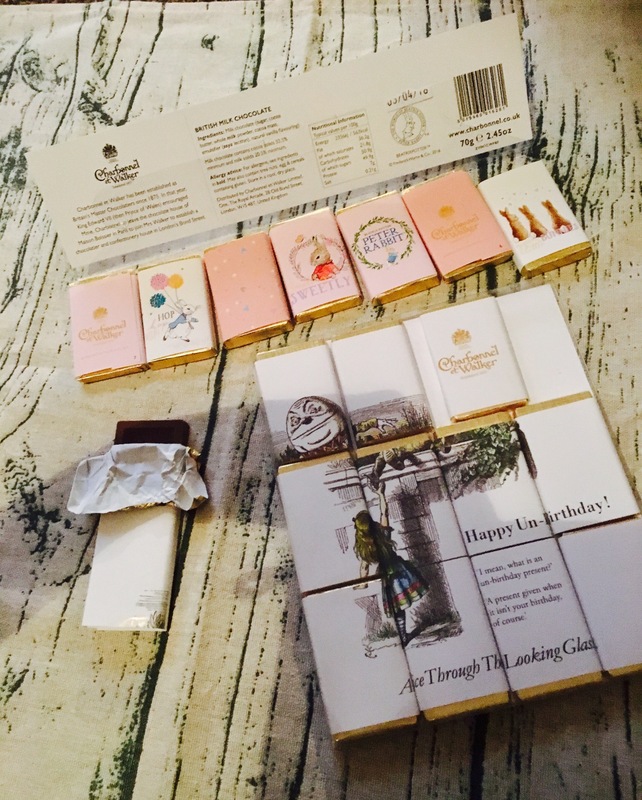 I think the least expensive item is one of their 80g chocolate bars which cost £5.00 each one, so you get an idea of just how luxury this chocolate is. Like many other chocolatiers they have chocolates for everyone and for every occasion and even have themed chocolates for children. We have a few of their children’s chocolate products here. 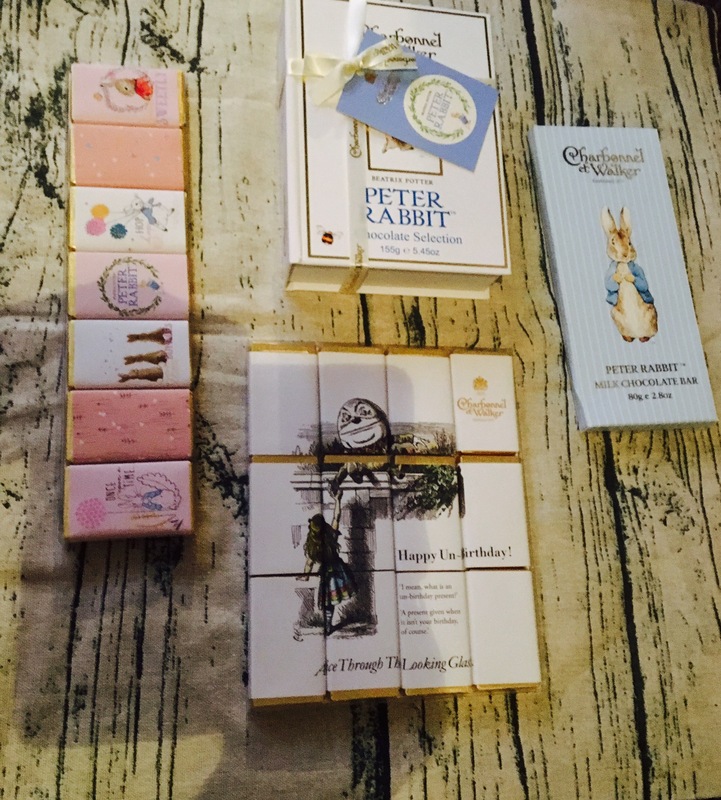 Charbonnel’s children’s gifts include themes of Peter Rabbit and Alice through the looking glass. With a company like this; it is not just about the chocolate inside (which of course is exceptionally good) but the packaging too. No one wants to pay extra for chocolate that comes in plain or not so nice wrappers as it’s just not as appealing. These are two of the Peter Rabbit products. The blue packet on the left is an 80g chocolate bar which costs £5.00. I would not normally pay this much for a bar of this size, but again this is a luxury brand. The Peter Rabbit box is part of a gift set costing £29.00. 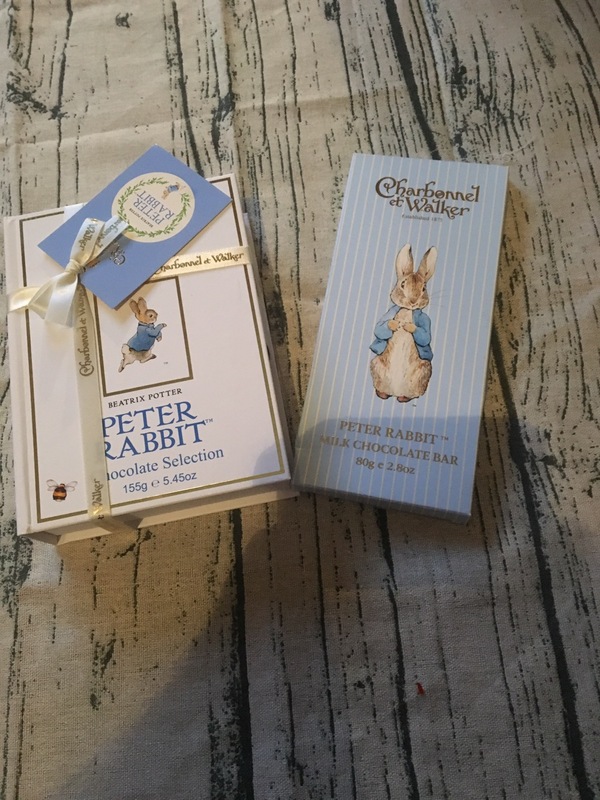 The set includes a Peter Rabbit book and a mixed box of chocolates. The box is fully reusable, made of tough board and could be used for small toys, trinkets, bobbles etc. I think if I was to pay £29 then I’d certainly want to keep the box too. 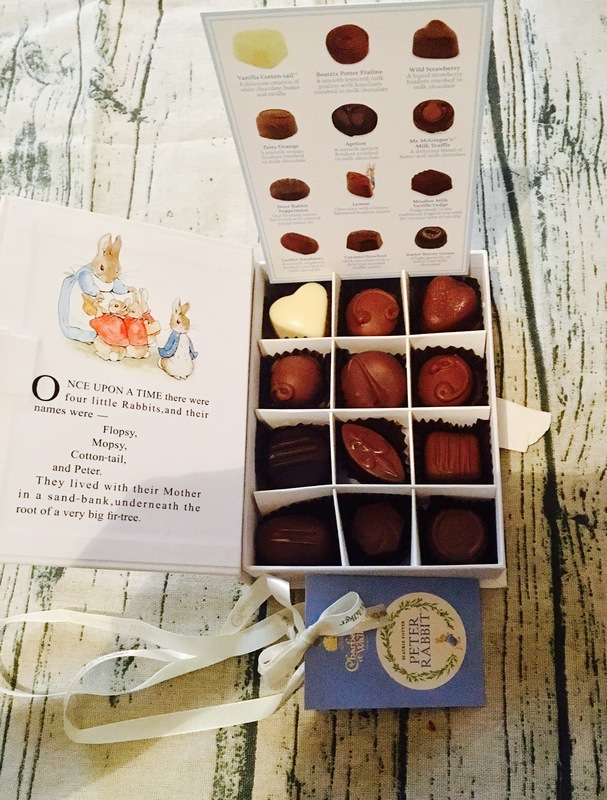 The chocolate box can also be purchased alone, without the book for £25.00, but in my opinion you may as well pay the extra £4.00 and then at least there is something to show once the chocolates are gone. These slim/mini bars come as both the character theme packs. A seven bar pack is £6.95. If you’re wondering what an Un-birthday is; as it says on the larger pack then here is a short explanation which I spotted on one of the bars. The chocolate inside is very good quality, a lovely creamy chocolate taste which sort of just melts in the mouth and we have too much of it! Yes I know, it is meant for my children but I’m a big kid at heart and this luxury stuff is just too good. 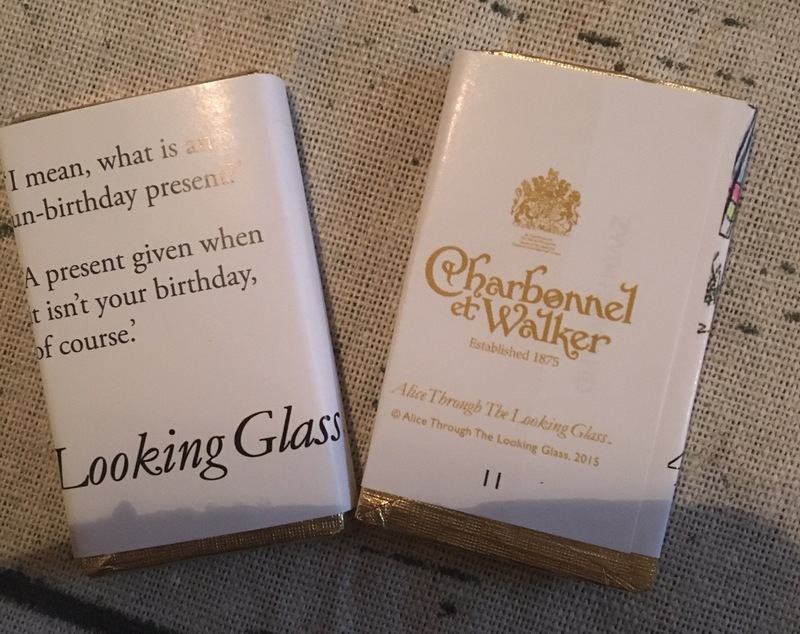 Here’s their website if you want some too, and you don’t like anywhere near London – Charbonnel et Walker. And now I’ll get back to eating it all!